Traffic blocks play an important role in creating temporary traffic islands and junctions. Marshalls’ concrete traffic blocks are flexible and versatile, allowing any size or shape of traffic island to be constructed so trials can be undertaken without the need for excavation. Simply connected by means of a galvanised bar attached to a central bolt, they allow for speedy installation and removal, whatever your timescale or size of project. They are available in Black, Yellow, Grey and White. 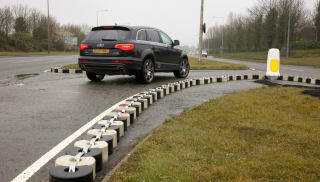 Marshalls’ interlocking road traffic blocks are compliant with the Highway (Road Humps) Regulations 1990 and Road Humps (Scotland) Regulation 1991, as well as with the Highways (Traffic Calming) Regulations 2000. They also comply with Local Transport Note LTN 01/07 and 01/08 policies. Browse the full range now.